Would you like a soothing sensation of wellbeing and serenity? To finally relax again with a flavorless capsule? Now you can, so make sure you choose the valerian in capsule format. Dosing has never been so easy! By means of the valerian herb you will experience a relieving sensation, it will make you feel very relaxed and it has a positive impact on the nervous system. Your night’s rest may also be improved! Experience the effect of valerian on your body now. 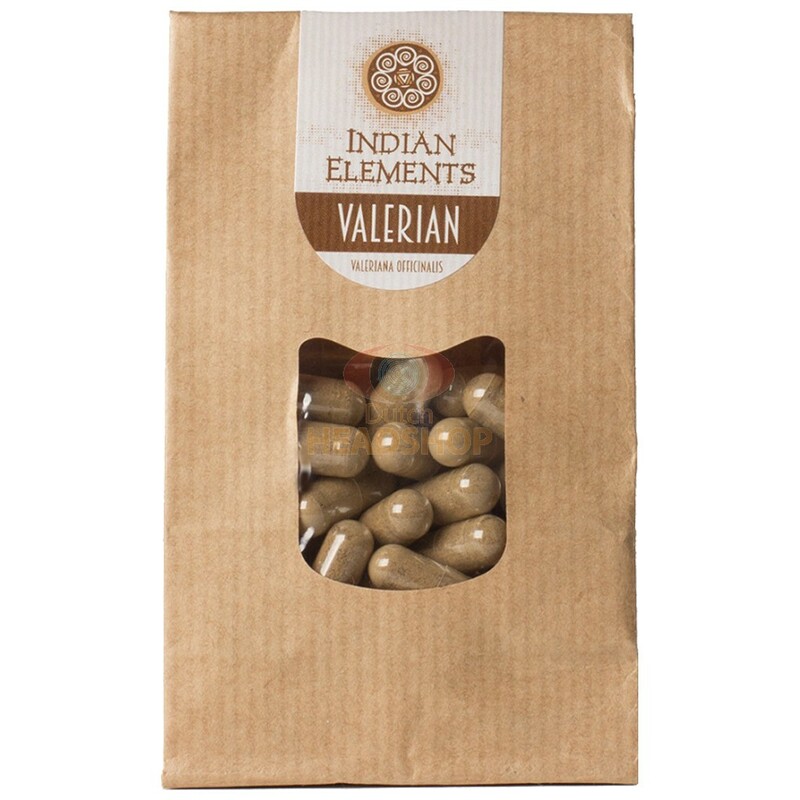 The original Indian Elements Valeriana Officinalis capsules. For a relaxed feeling of well-being and serenity. The active substance valerian comes in a handy capsules so you can always dose the right amount. Valerian is a herb from the Honeysuckles family. Valerian is a herb with a relaxing effect, it has a positive effect on the nerve system. It also is an excellent agent to improve your night's rest. If you want to nicely relax and totally come to peace, then Valerian is a herb to consider. It does not only has a relaxing effect, it can also reduce headaches, muscle pains and cramps. Valerian is used as a medicinal herb since the time of ancient Greece and Rome. Hippocrates described its properties, and later on Galen prescribed it as a medicine against insomnia. In the Middle ages in Sweden, it was sometimes placed in the clothes of the groom to protect against the 'envy' of elves. In the 16th century, the Anabaptist reformer Pilgram Marpeck prescribed valerian tea to ill people. You won't get high or stoned on these capsules. You will get peace of mind and a relaxing feeling. You will sooner feel an urge to go sleeping. Because of the relaxing effect, it is recommended to use Valerian in the evening. If you are someone who experiences a lot of stress, or you have difficulties to fall asleep, then valerian is worth to try. Especially if you tried other medication that didn't help you out. Valerian can also be used as an effective trip stopper. In case your truffle or mushroom trip gets too heavy, you can use valerian to get calm or reduce fears. Persons that suffer from panic attacks can also benefit from Valerian. Valerian cannot be use in combination with MAO inhibitors en we strongly discourage participation in traffic after taking these valerian capsules. Smart drugs offer people beautiful experiences, but are not suitable for everyone. Therefore, have a look at the disclaimer before ordering.